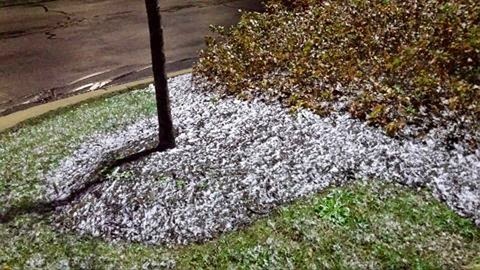 UPDATE: Officially recorded at the airport this morning was 0.1" of snow, making it the earliest measurable snowfall of the season. 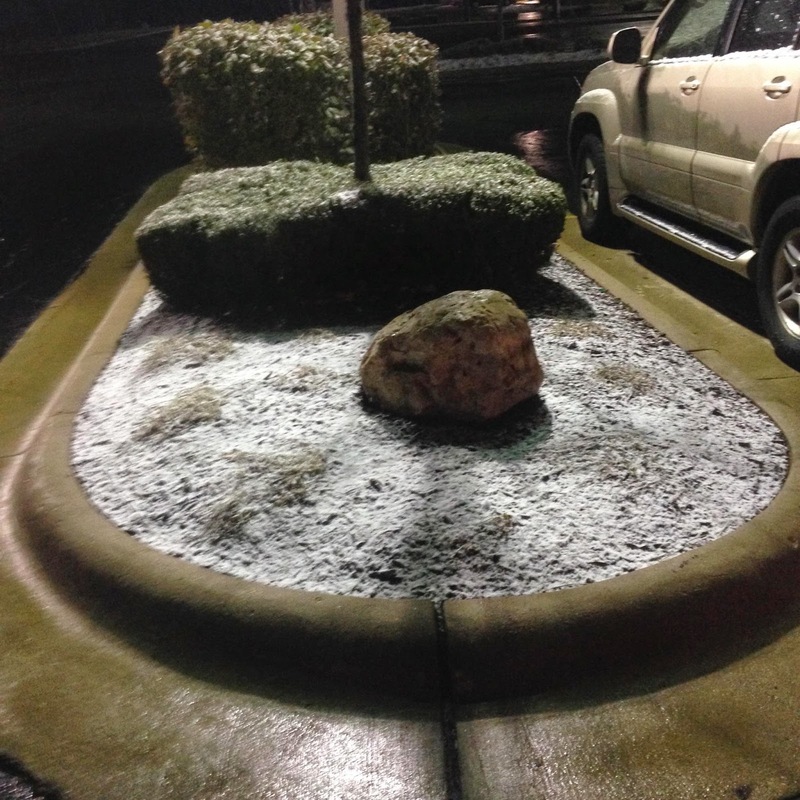 On average, Rockford receives it's first measurable snowfall around November 29th. No, your eyes weren't playing tricks on you this morning. 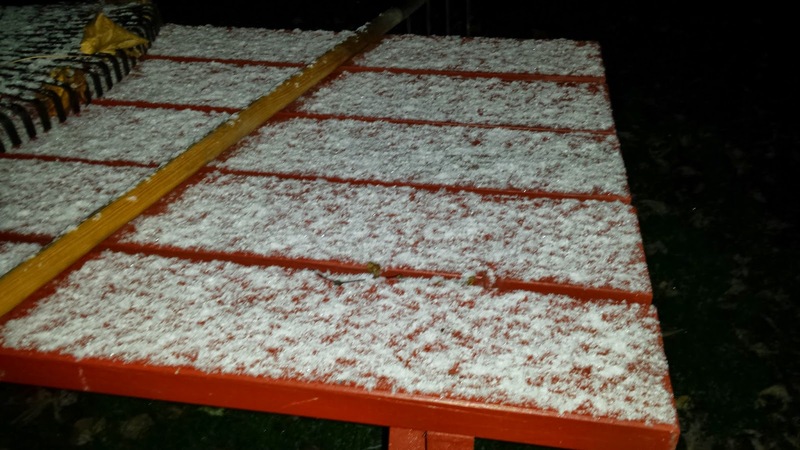 Strong low pressure sliding through Wisconsin this morning brought a quick burst of snow with minor accumulations on grassy surfaces. The snow will fade by 8am, but the wind and chills will stick through tonight. Mom and dad you may want to rethink some of those Halloween costumes Friday, or at least put some long underwear on underneath for the kiddos. 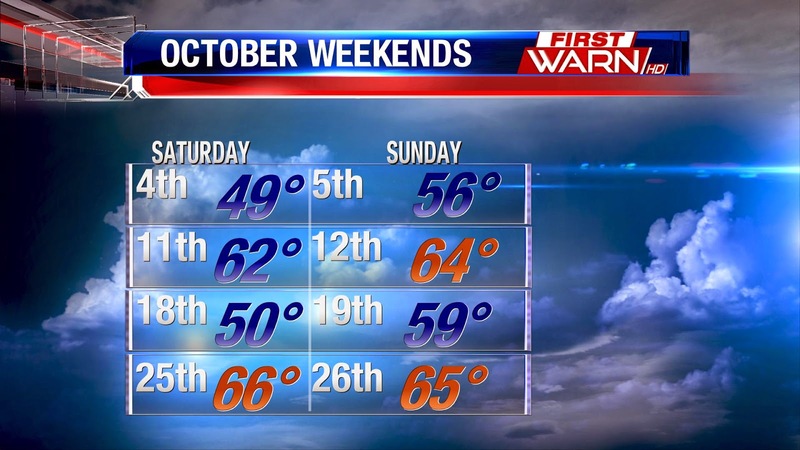 It's going to be cold at the start and even colder at the end of trick-or-treating. Temperatures around 4pm will range from the upper 30's to low 40's with wind chills right around 30 degrees. 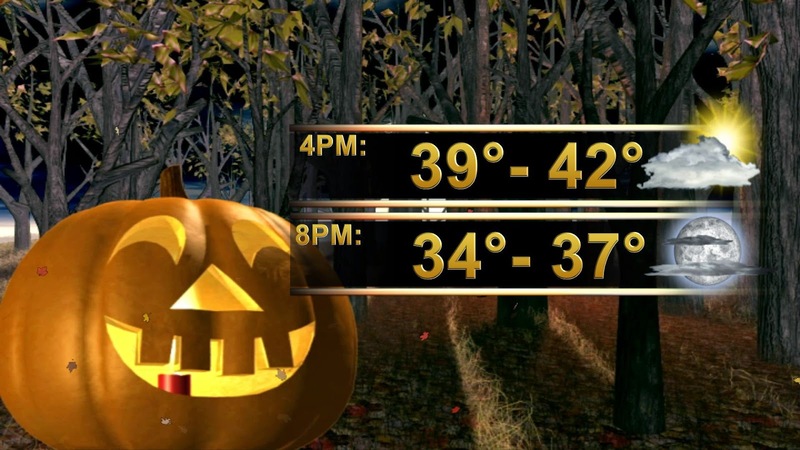 By the time trick-or-treating ends, temperatures will have fallen into the low 30's, but the wind chills will be in the md-20's. Low pressure still in central Canada Thursday morning will slide south down the western Great Lakes tonight pushing a strong cold front through right around midnight. As it does, temperatures will quickly drop into the low 30's with north winds gusting close to 30 mph by daybreak Friday. This means wind chills by Friday morning will be in the 20's. North winds will gust between 35-40 mph during the afternoon Friday, with winds sustained right around 25 mph. Unfortunately, those strong winds will win out over any sunshine we're able to see keeping temperatures in the low 40's and wind chills in the upper 20's/low 30's during the afternoon. 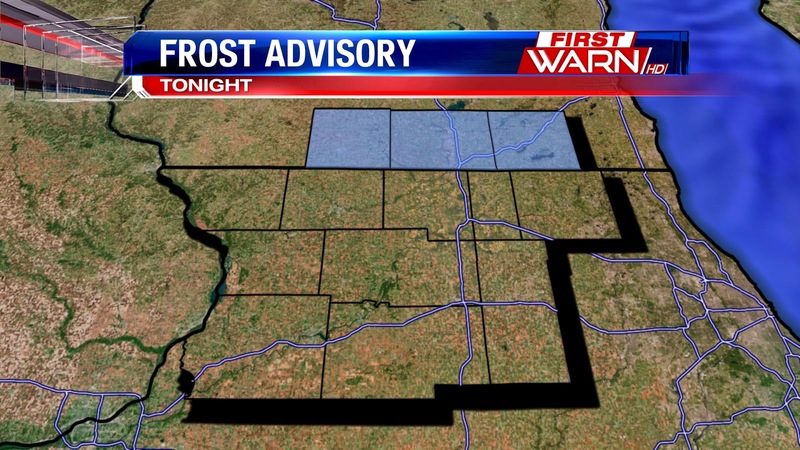 Winds will ease some after 6pm, but the temperature will tumble into the 20's during the overnight. It could be one of the coldest Halloween days we've felt in years on Friday! Mother Nature will be giving us few treats this year as cold air is set to dislodge itself from central Canada. The average high for the 31st of October is 56°, but this year temperatures will be running 10°- 15° below that. You have to look all the way back to the Halloween of 2009 to find temperatures in the 40's. The high that day was 46°. 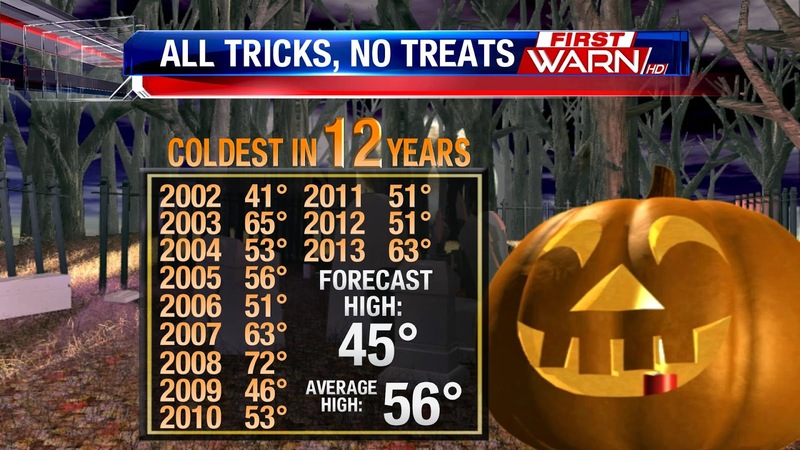 If we fail to reach 46° Friday afternoon, this Halloween would be the coldest in Rockford in 12 years! It was 2002 that the high only reached 41°. That's a long time! Right now, we're forecasting a high of 45°. CAA, otherwise known as Cold Air Advection, is what you're feeling outside this morning. Temperatures today will be 20-25 degrees colder than they were Monday when the mercury climbed into the upper 70's! 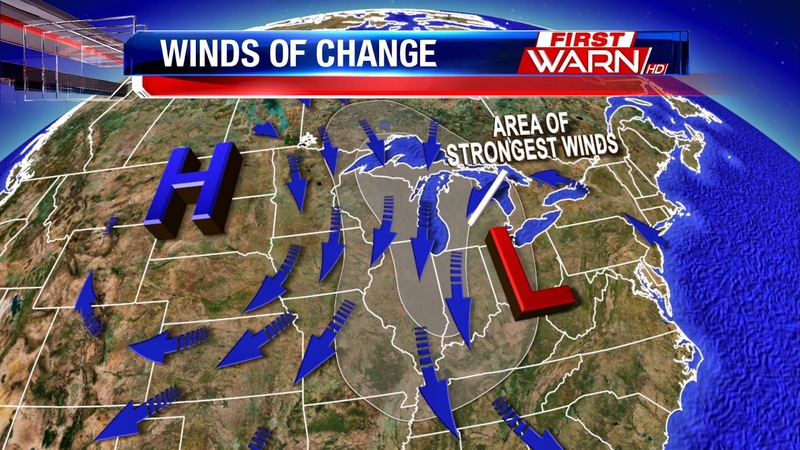 This is because a strong cold front came through around Midnight shifting winds around to the west. Even if we see sunshine today, the colder air filtering in will hold temperatures in the 50's for the afternoon. Skies will continue to clear tonight with overnight lows dropping into the upper 30's. We didn't see record temperatures Monday, but the warmth was still something to enjoy. 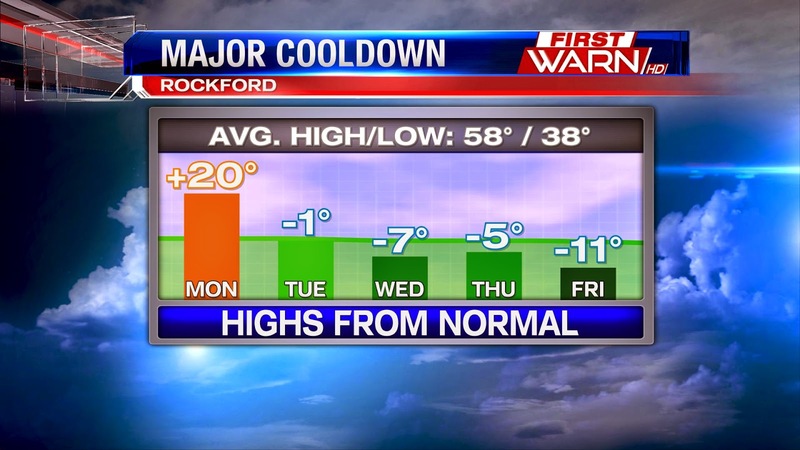 Rockford had an official high of 78°. The last time we saw this kind of heat this late in October was all the way back in 1971. 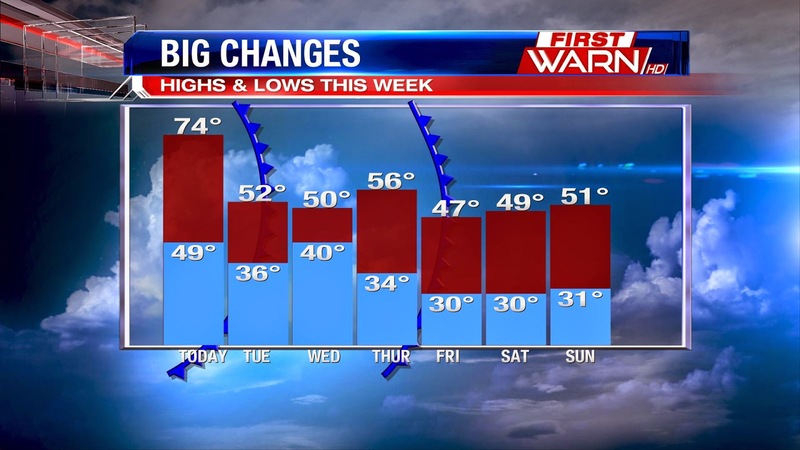 A cold front Monday night will start a cooldown that will last the rest of the week. Starting Tuesday and continuing through the rest of the week, temperatures are forecast to be below normal. 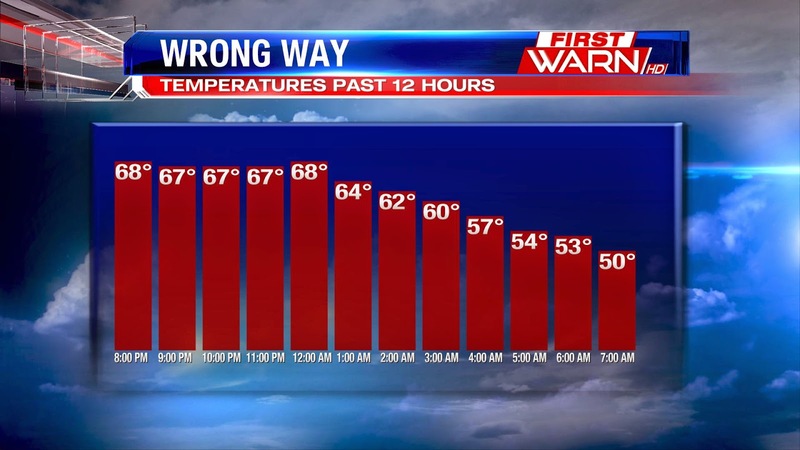 Temperatures this morning were already near our average highs with a few locations touching close to 60° before 9am! With a strong south wind, highs will climb into the middle and upper 70's this afternoon rounding off what was a beautiful weekend. With that strong wind, some have a shot of reaching close to 80° along I-88! For the record, our record high in Rockford is 84° set back in 1927. I don't think we'll get that warm, but it will be warm enough. Don't get too used to it, however, because the first of two strong cold fronts is set to sweep through this evening bringing us back down to reality by Tuesday and Wednesday. The front will also bring with it a few showers and embedded thunderstorms this evening and overnight. Temperatures this evening will hold in the 60's until the front passes and then fall into the upper 40's/low 50's by Tuesday morning. A gusty west wind during the afternoon won't cool us off too much, but we'll be a good 20 degrees colder during the afternoon than what we'll be today. A second cold front is set to slide down the Great Lakes Friday morning pushing the mercury even further down with highs staying in the 40's. Even though we'll be falling back below average, temperatures in the low 50's and upper 40's are actually closer to our average high than the forecast middle 70's for this afternoon. Just to put things into perspective. I thought it was suppposed to be sunny today. What gives? 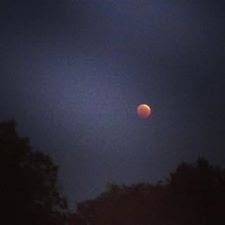 The forecast last night and this morning called for fog, but stated the fog would be out of here mid-morning and skies would begin to clear. Well, it's 10:10 am and the fog is still pretty thick outside and showing no sign of letting up anytime soon. So, what happened? Well, there is a meteorological reason as to why the fog is sticking around longer than forecast (and it's not just because we don't know what we're talking about). 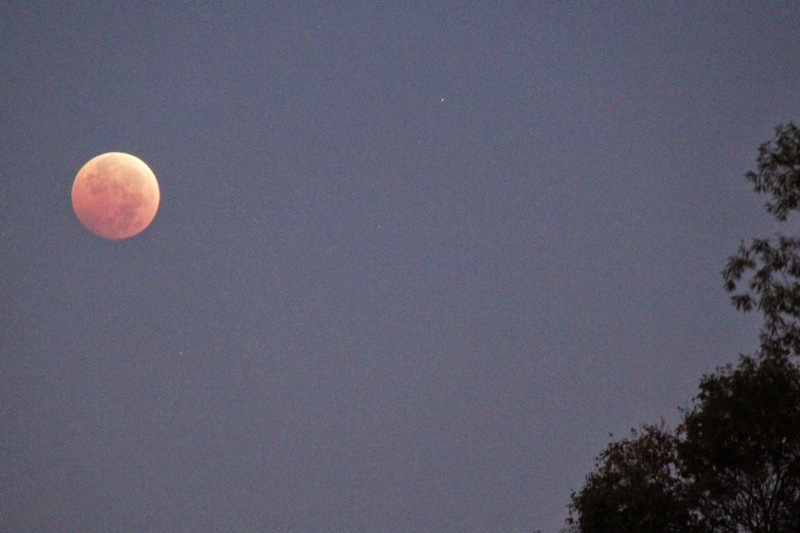 After Thursday's rain, skies began to clear and the winds turned calmed. With the added moisture in the atmosphere, this was a nice set up for fog development and that's exactly what happened. This morning, however, the incoming cirrus clouds from the west have trapped that moisture near the surface. 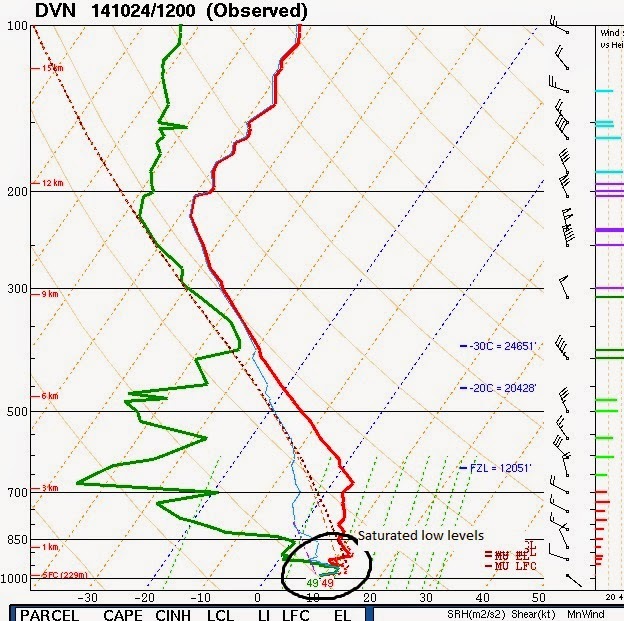 This is evident on the morning forecast sounding from the Quad Cities office in Davenport, IA. The green line indicates the dew point temperature and the red line indicates the air temperature throughout the atmosphere. 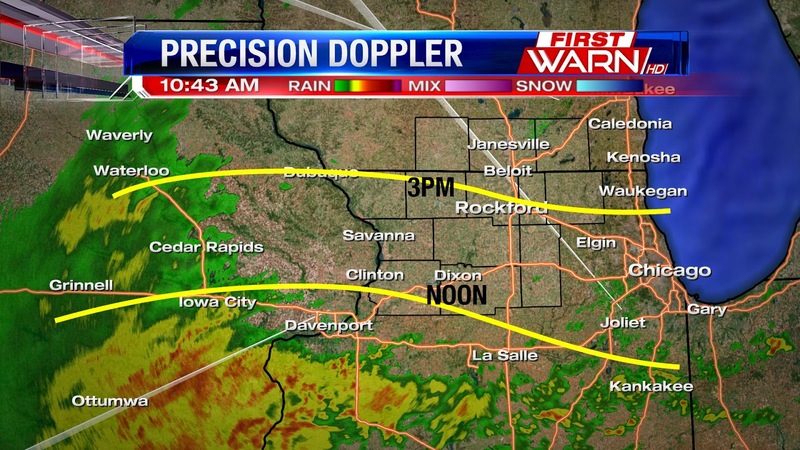 When those two lines are close to each other, it usually means there is some sort of saturation (moisture) present. Whether it be in the form of clouds or fog. 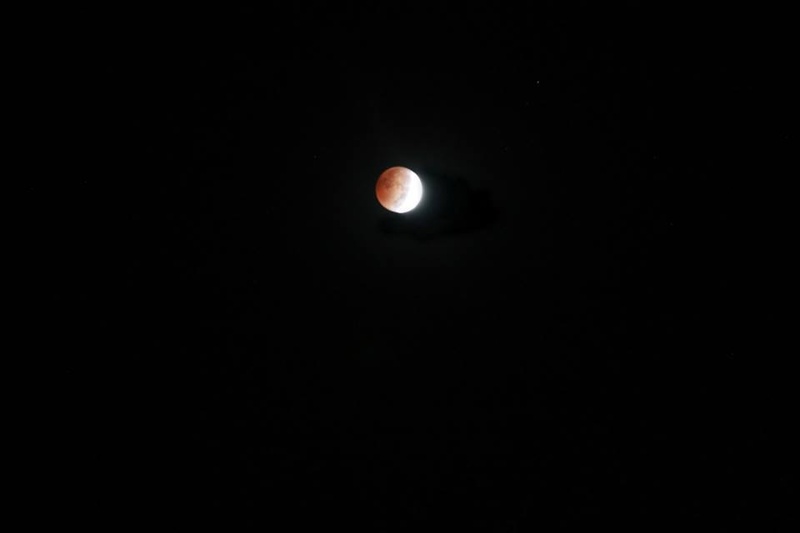 When the two lines are pretty much on top of each other, this means that the atmosphere is very saturated. 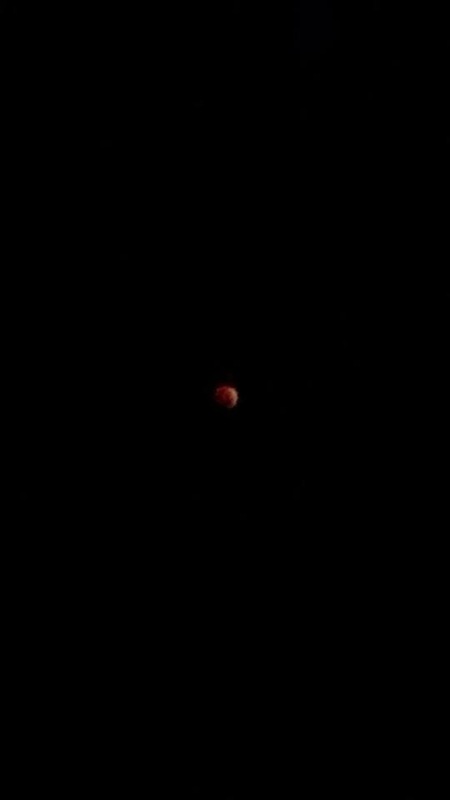 There is also a little convergence (winds coming together) just above the surface which has helped keep the fog around. Adding to that, there is a small inversion present (warmer air aloft) that is also helping to keep the fog settled in at the surface. 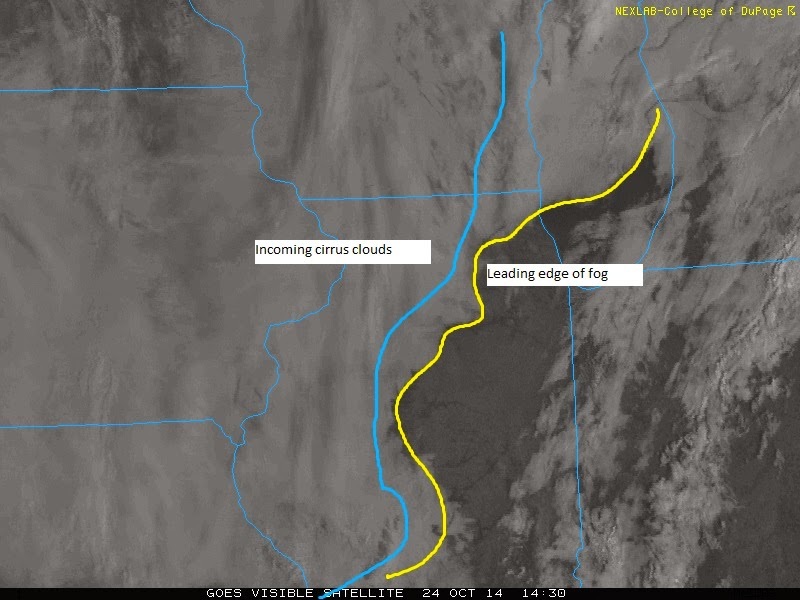 Looking at the visible satellite image, we can actually see where the edge of the fog is and where the clouds are present. Some good news is that the fog has been eroding away from the east, but the bad news is the cirrus clouds continue to move in from the west. This means areas east of Rockford will likely see a little more sun while from Rockford on westward, we may be stuck in the fog through the early afternoon. 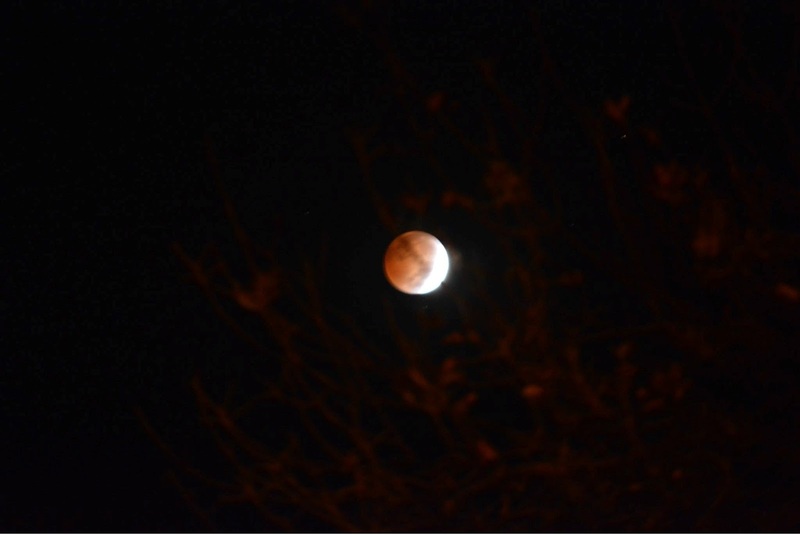 If there wasn't any cloud cover, the fog would have had a better chance of lifting due to the help of the sun. Since we don't have that this morning, the fog is more likely to stick around longer and make the afternoon much cooler. 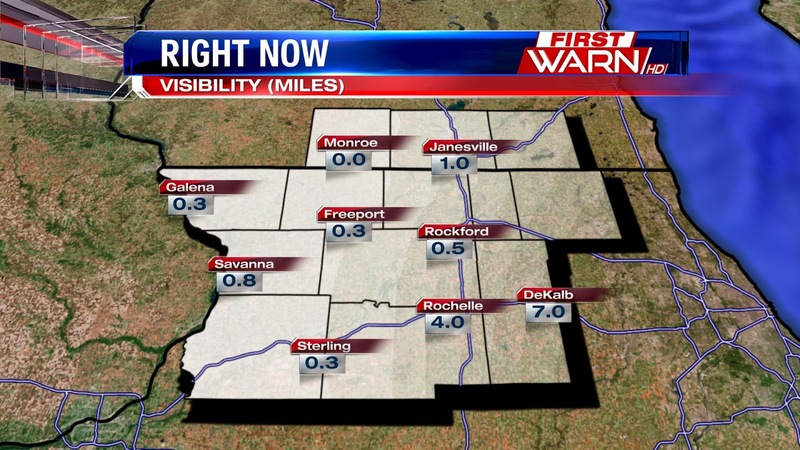 A Dense Fog Advisory remains in place until Noon for Stephenson, Jo Daviess, Carroll, Whiteside and Green counties. It seems as if the time has just flown by as we enter into the last weekend of October. And while the weather has been tolerable over the weekends, temperatures have been generally cooler than average. With the exception of one Sunday afternoon where the high was spot on the average, 64 degrees on the 12th, afternoon highs have been below average. That won't be the case this weekend with temperatures rising back into the middle 60's. An approaching warm front Sunday night and Monday will push highs close to 70 degrees, but it will only last one day. After Tuesday, we'll fall back into the 50's by the end of next week. 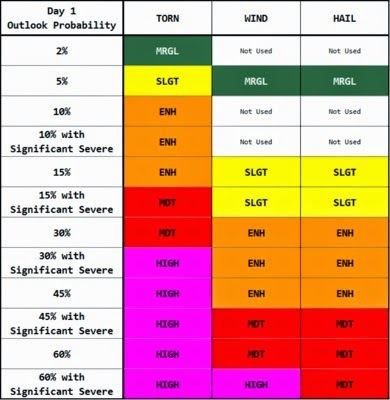 If you follow severe weather, you know the Storm Prediction Center (SPC) issues daily forecasts that warn the public of possible severe weather. In an attempt to simplify these forecasts, SPC is making some changes to their outlooks starting Tuesday, October 22nd. With the old outlooks, the "See Text" risk doesn't really convey a meaningful severe threat. The "Slight" risk also covers too large of a range when it comes to possible severe weather. SPC is hoping the new outlooks will solve these problems. The new outlook breaks up the "See Text" risk into non-severe thunderstorms and a "Marginal" risk. The outlook also keeps the "Slight" risk, but adds an "Enhanced Slight" risk to help denote areas with a slightly higher severe threat. The "Moderate" and "High" risks will remain the same. -10% or greater probability of non-severe or near severe thunderstorms. - 5% or greater severe hail or severe wind probability. - 15% or greater severe hail or severe wind probability. - 30% or greater severe hail or severe wind probability. - 60% or greater severe hail probability. - 60% or greater severe wind probability AND a 10% or greater probability of a wind gust 75 mph or greater. For a closer look at how SPC is changing the Day 1-3 Outlooks, click here. Cloud cover is an important tool meteorologists look at when trying to determine both high temperatures during the day and low temperatures at night. So what's the relationship? Think of clouds like a reflective blanket hanging in the atmosphere. It can either keep heat in at night or prevent heat from getting in during the day. Tuesday was a perfect example of how cloud cover can affect temperatures. Eastern parts of the Stateline started off the day with cloudy skies, helping to keep morning lows in the lows 40s. Areas to our west that saw clearer skies also saw lows well into the 30s. Heading into the afternoon, the cloud cover stuck around for the eastern portions of the viewing area. That kept highs in the low to mid 50s. Areas to the west that saw more sunshine warmed into the upper 50s. The weather for the first couple weeks of October was kind of cool and definitely rainy. This week, we've entered into a little more of a drier pattern with only a few opportunities for rainfall - Thursday and then again next Monday. The dry weather will be nice for the local farmers as there were only two or three days that were suitable for getting out in the fields to finish the harvest last week. 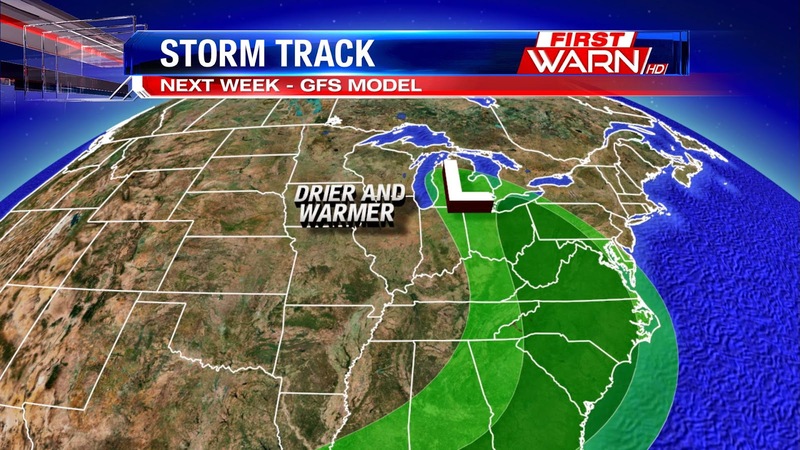 To add to the drier pattern will be the warmth that is expected to arrive by the end of the week and for the weekend. A pattern change in the jet stream will shift winds around to the southwest on Saturday which will give temperatures a nice boost back into the 60's, possibly even the 70's! Winds will be strong on Sunday with gusts close to 30-35 mph, and this time of year you need a strong wind to get those kind of temperatures. But hey, who's complaining. Unfortunately, after next Monday we're back down to reality behind a cold front with temperatures falling back into the 50's. 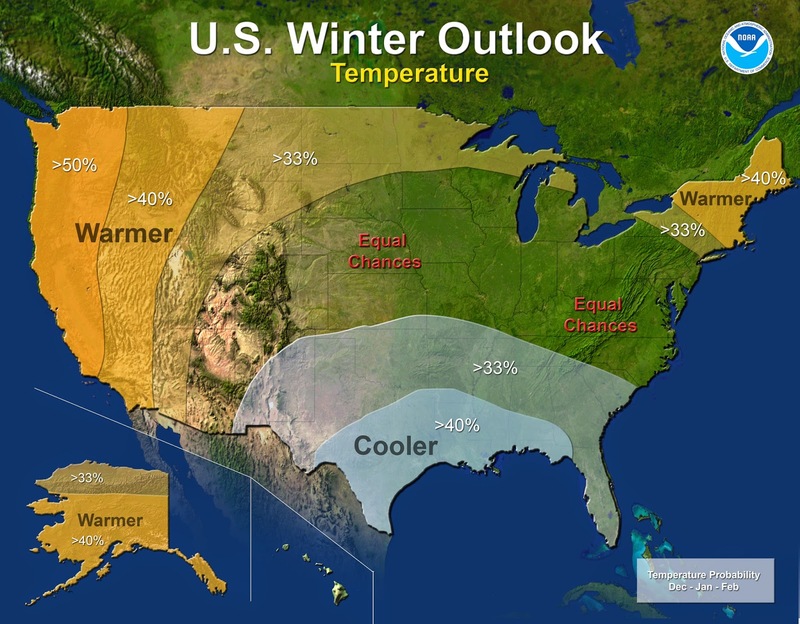 U.S. Winter Outlook: A repeat of last year? Mike Halpert, Acting Director of the Climate Prediction Center, says it's unlikely that we'll see the cold pattern take place this winter like we did last winter, but cold snaps are likely. After all, it is winter and there will be cold. He also says what made last winter so memorable was not the cold outbreaks, although those were extreme at times, but the persistent pattern through the entire winter. Meaning once we got past the December/January time frame, there was no break down of the cold. The cold continued into the middle of March! And looking ahead to this winter there, at this time, appears to be no signals that suggest this type of persistent pattern taking hold once again. El Nino, which is an ocean-atmospheric phenomenon in the Tropical Pacific that affects global weather patterns, could still develop this upcoming winter. Right now, this has not taken place but Climate Prediction Center forecasters do expect a weaker El Nino episode to develop within the next month or two. Unfortunately, unlike with stronger El Nino episodes, a weaker one offers little help in trying to determine the winter outlook. So the current outlook is more consistent with an El Nino event, but the probabilities are just a bit lower. While there are no strong signals as to whether temperatures over the three month winter period will swing above or below average, it does appear that there is a slightly higher probability of a drier than normal pattern across the Great Lakes. Bottom line with this forecast is this, seasonal forecasts are a young and evolving science with many different tools, both new and old, forecasters use. While El Nino and La Nina events are something that can influence the weather across the U.S., we also have to look at other atmospheric circulations and phenomena that, at this time, are still evolving in trying to understand. 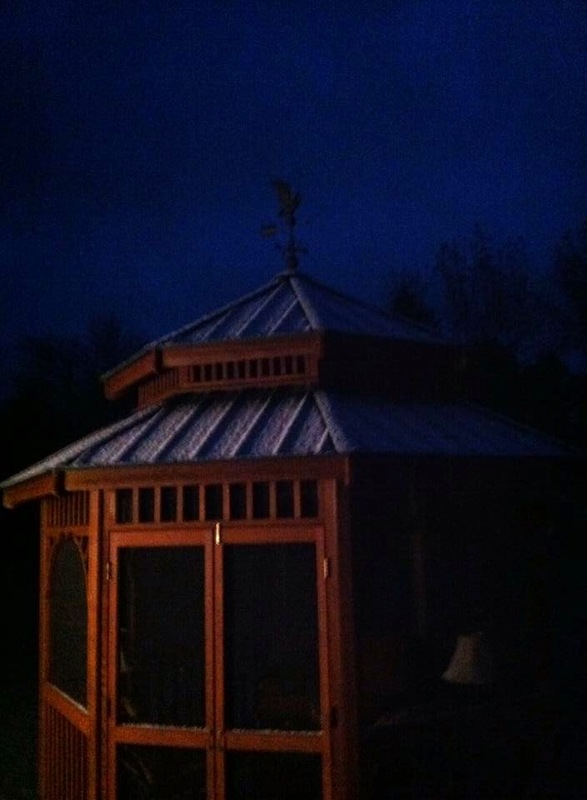 Looking ahead, there will be cold and snow this winter - that's a given. But the probability of having the extreme cold like we did last year is unlikely. 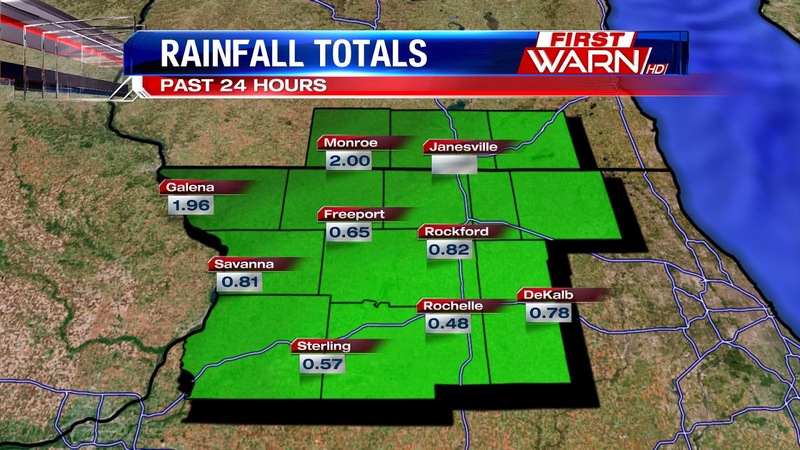 Rainfall totals ranged anywhere between half an inch to two inches Monday evening. Today's rainfall won't be quite as much, but I wouldn't be surprised if another half an inch to three quarters inch of rain fell by this evening. Showers have already begun to overspread early this morning and will remain scattered through Noon. 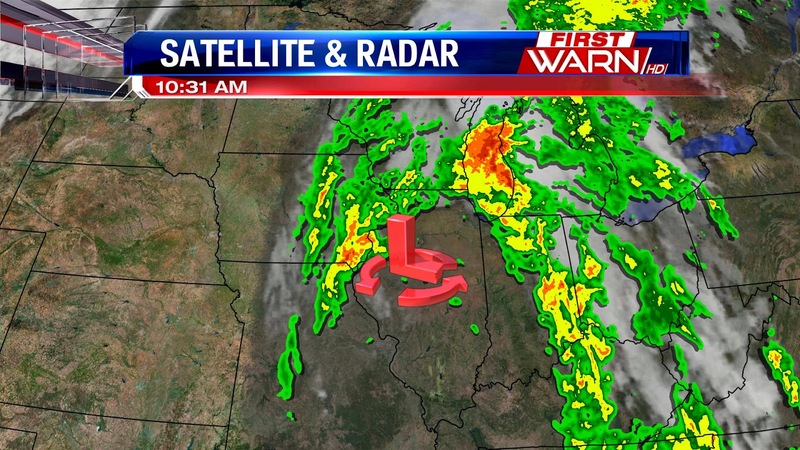 Low pressure moving out of west-central Illinois will pull closer to north-central Illinois by this afternoon. As it does, a few breaks in the cloud cover could help fuel some isolated thunderstorms into the early afternoon. Severe weather isn't anticipated, but if storms were to develop stronger wind gusts could be possible. 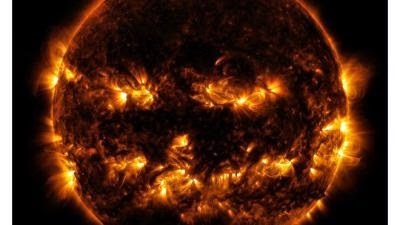 Even the sun is getting into the Halloween spirit! 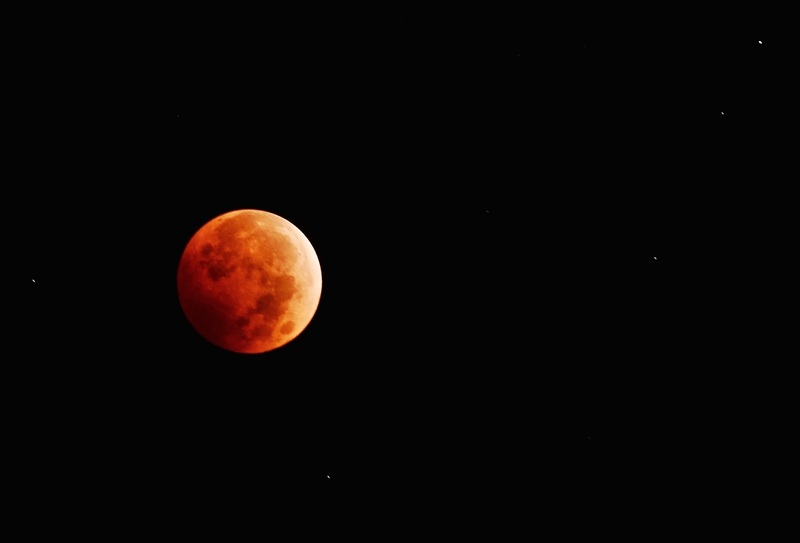 Back on the 8th of October, the sun showed its more 'spooky' side with brighter spots that look like a grinning pumpkin. NASA says the active regions of the sun appear brighter because those are the areas that emit more light and energy. They indicate an intense and complex set of magnetic fields around the sun's atmosphere, known as the corona. A significant severe weather event will likely unfold across Arkansas, Mississippi, Kentucky, Louisiana and southeast Missouri this morning and afternoon. An ongoing line of severe thunderstorms has already produced at least one tornado in Arkansas this morning with one confirmed fatality. Severe weather this afternoon will remain in the middle and lower Mississippi River Valley closer tied to a strong cold front and low pressure system. Further north, heavy rainfall will become a concern this afternoon and evening for northern Illinois and southern Wisconsin. Skies will remain cloudy through the morning and early afternoon for the Stateline with the threat for rain increasing after 2pm. Showers with embedded thunderstorms continue to lift north and will reach the Quad Cities between 11am and Noon, and the I-88 corridor around 2pm. While these thunderstorms are not expected to be severe, heavy rainfall into the evening will be likely. Drier air wrapping in on the backside of the low could cut off some of the rainfall overnight, but additional showers are likely through mid-day Tuesday. Through Wednesday morning, one to two inches of rain will be possible. Other than a few showers here and there, it's been a pretty quiet couple of weeks in the weather department and that trend looks to continue through the weekend. Next week, however, a big pattern change is in the works that will bring rain and even a few thunderstorms with it. While the rain is for certain, it's what will happen in the days that follow that are a little more fuzzy. 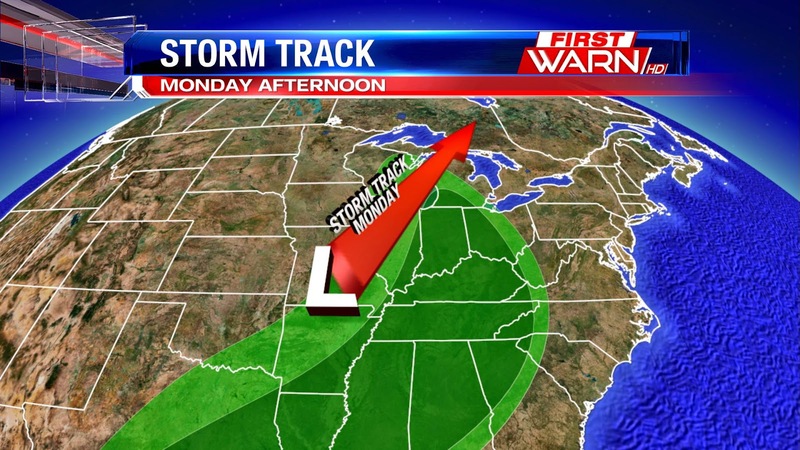 system and dynamics from the jet stream, another round of heavier rain could be possible by Monday evening. However, forecast models disagree as to just how fast the low shifts east. The European forecast models want to hang on to the low a little longer and basically cut it off from the main jet stream. If this were to happen low clouds, a cool east breeze and scattered showers would persist through at least next Wednesday. The American GFS, however, quickly shifts the low to the east with a strong ridge of high pressure building in behind. 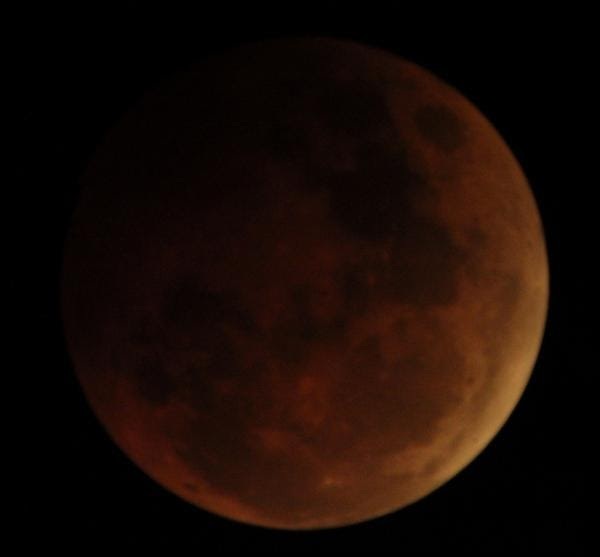 If that were to happen, skies would clear and temperatures would rise back into the middle and upper 60's. Large scale systems, like the one expected Monday, are more likely during the spring and fall months because that's usually when we begin to see the greatest temperature contrasts from north to south. With these types of systems, they also tend to move a little more slowly which makes me believe the low will hang around through at least Wednesday, if not Thursday, before moving east next week. Clear skies and calm winds allow temperatures to fall quickly, allowing us to get to the freezing conditions needed for frost. You also need a little bit of moisture in the air. 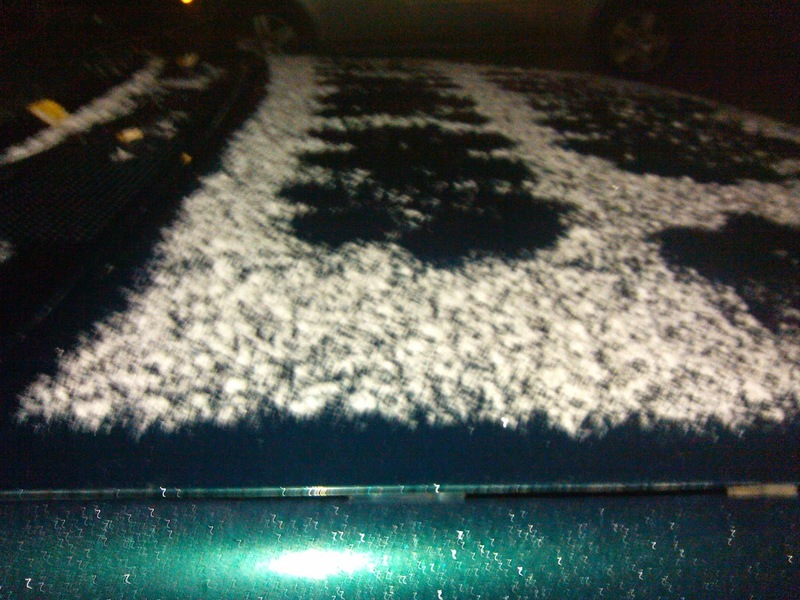 Since ice is made of water, moisture is the obvious fuel you need if you want to scrape your car's windshield off in the morning. 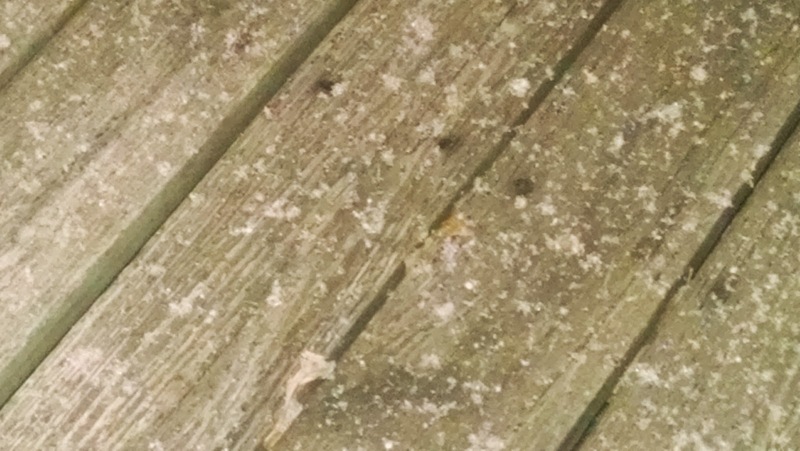 Winter woes: Could this winter be like last winter? It's been the topic of discussion for many over the past few weeks. 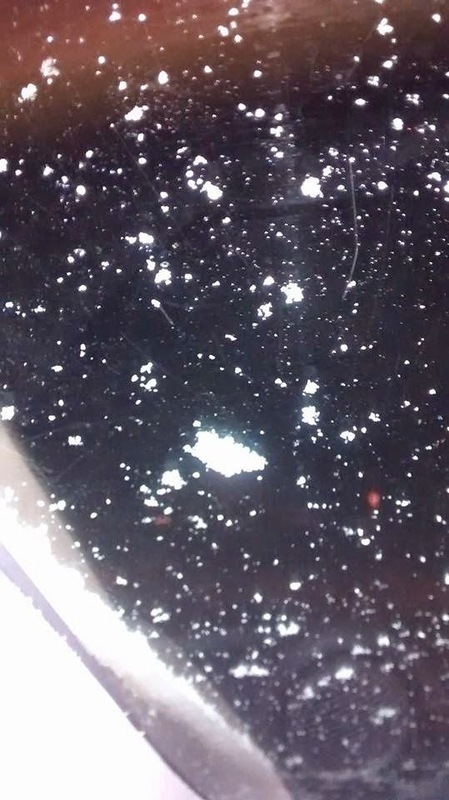 Just what does winter 2014-2015 have in store for us? 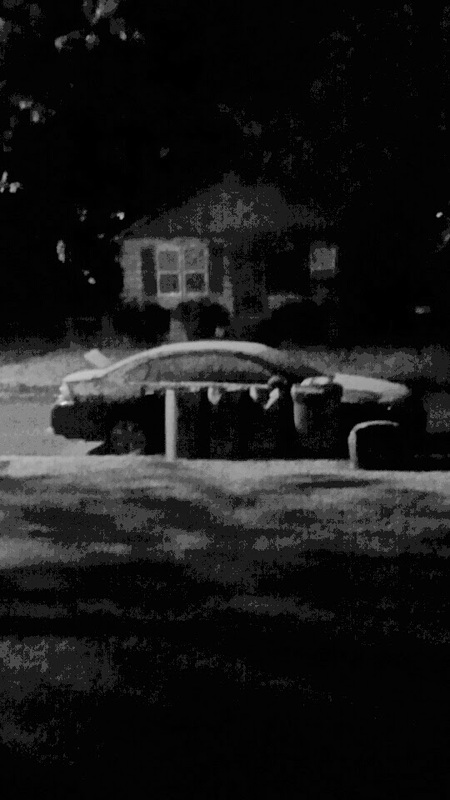 Is it going to be like last winter - snowy and cold? Or, are we going to have something completely opposite? Time will tell, but there are some atmospheric signals we can look at that may give us a little bit of a clue as to what we can expect. This past summer was just a littler cooler and wetter than average, although not by much. El Nino occurred during the summer and the Climate Prediction Center gives roughly a 60% - 65% chance of El Nino emerging during the fall and winter months. Forecasters are expecting a weak El Nino event to occur and last through Spring 2015. 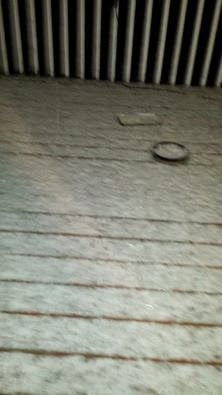 What does that mean for our winter? 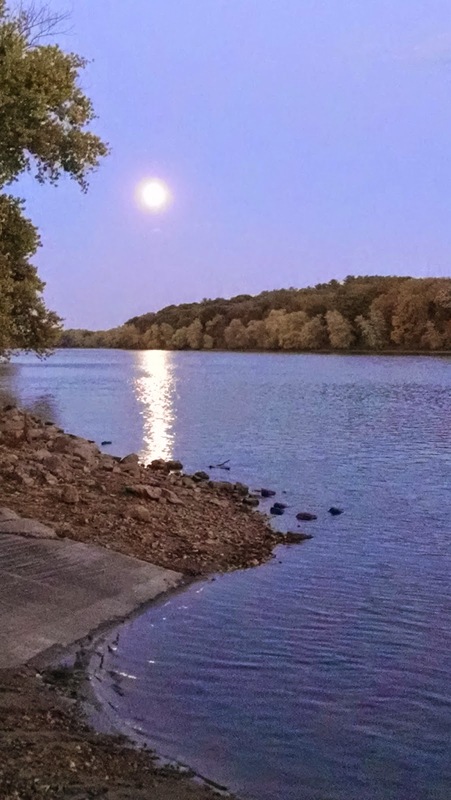 Well, according to Jim Angel, state Climatologist with the Illinois State Water Survey, El Nino events can vary in size, duration and intensity which can lead to variation from event to event. 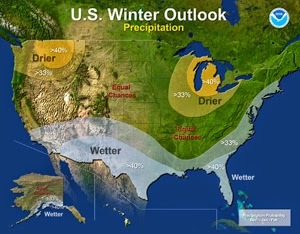 Overall, the general trend of El Nino during the winter months include a warmer and drier winter with roughly 70% - 90% of average snowfall. 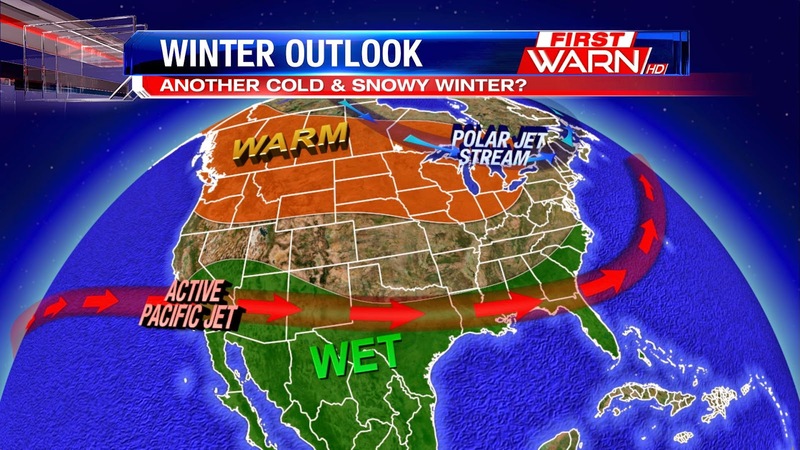 The Polar Jet Stream is shifted north and a little weaker than the Pacific Jet Stream which remains across the south. This keeps the wet weather and active storm track to the south with slightly warmer than average temperatures in the northern Rockies, Plains and Midwest. Remember, though that this is the 'average' trend and there can be exceptions. While we'll likely have some pretty cold and snowy days, the overall three month average temperature & snowfall could be slightly warmer and near normal snowfall. Rainfall midweek? What does Simon say?